A quick one this! Not strictly a vRealize Automation issue but…..
Customization of the guest operating system ‘rhel5_64Guest’ is not supported in this configuration. Microsoft Vista (TM) and Linux guests with Logical Volume Manager are supported only for recent ESX host and VMware Tools versions. Refer to vCenter documentation for supported configurations. I couldn’t see anything wrong with the process I was using but on the summary page for the VM, it was reporting that VMware Tools weren’t installed. That was strange as the Linux team (who created the templates) assured me that they did install the latest version on them. … and then I realised! Most Linux admins like doing maintenance/installations in Single-User Mode to avoid unnecessary interference during their operations. Normally, it’s not a problem as the system is rebooted after that and everything returns to normal. However in this case, it seems that VMware Tools were installed in Single-User mode but the VM was shutdown immediately after and converted into a template. That means the system never came up in the normal mode, which the tools require to initialise themselves as Single-User mode doesn’t bring up all required services. 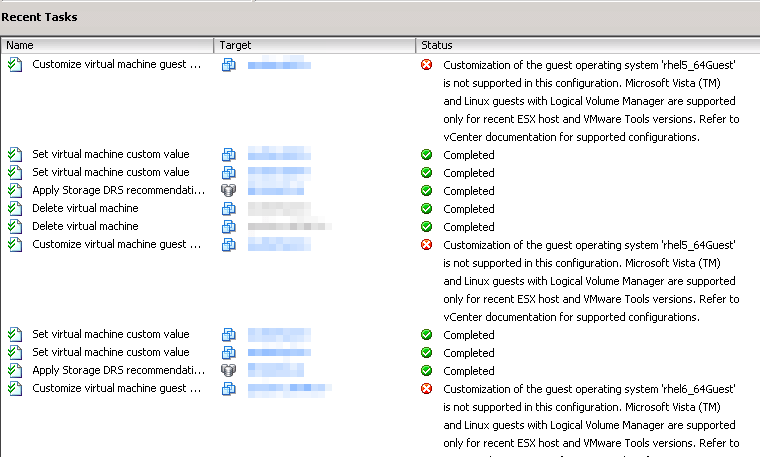 No VMware Tools meant customisation of the VMs couldn’t carry on after deployment and hence the error! To verify and fix, I converted the templates in question to VMs and booted them up. Once the summary page displayed “Current”, I shut them down again and converted them back to templates. The deployments after that worked as expected. Pulling out my hair over this – You’re amazing, thanks.